Scale is the biggest enemy of all household appliances that involve the use of mains water. JURA has developed a de-scaling tablet to extend the service life of your coffee machine by removing scale and yet still being easy on your machine. 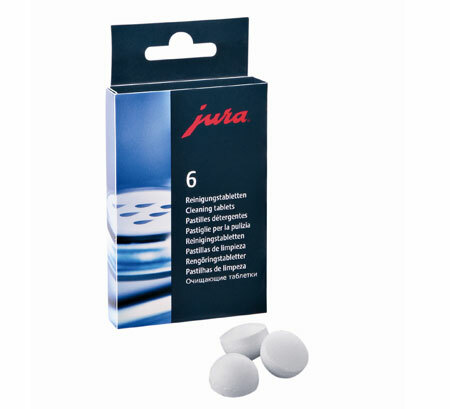 JURA de scaling tablets, pack containing 3 x 3 pcs. Tablets for descaling JURA fully automatic machines for coffee specialities Descaling tablets based on sulphamic acid specially developed for JURA fully automatic machines for coffee specialities, for thoroughly removing deposits and scale. The formulation is precisely adapted for use in JURA fully automatic machines for coffee specialities, and ensures effective descaling without damaging the material. As a result, the service life of your fully automatic machine for coffee specialities is extended. They can also be used in all other areas such as kettles, boilers, etc. where there are scale and deposits. The product is an irritant, i.e. temporary, protracted or repeated contact with the skin can lead to inflammation. The function of public sewage treatment plants is not affected even when relatively high volumes are added. Biodegradability is in accordance with the applicable conditions of the Washing and Cleaning Agents Act (WRMG – German Law). Keep the package tightly closed, protect against atmospheric moisture, water and heat. All constituents are biodegradable. Residual product can be disposed of down the drain. R36/38: Irritating to eyes/irritating to skin. S02: Keep out of the reach of children. S13: Keep away from food, drink and animal feeding stuffs. If the tablet, abraded material from the tablet or the prepared descaling solution gets into the eyes, immediately rinse with plenty of water. Consult a doctor. If the tablet, abraded material from the tablet or the prepared descaling solution is swallowed, rinse out the mouth and drink plenty of water. Consult a doctor. If the descaling solution gets onto the skin, immediately rinse off with plenty of water. 1. In a container, dissolve the content of one blister pack (3 tablets) in the volume of water specified below. Note: Use lukewarm water (max. 40 °C) to ensure it dissolves rapidly. 2. Start the descaling operation as described in the operating instructions. 3. Pour the mixture into the water tank at the time specified in the operating instructions. 4. The rest of the procedure is described in the operating instructions. Note: You can check the water hardness using the enclosed test strips.